Ya Jagoff!!! 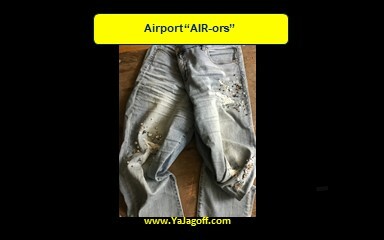 | Airport "AIR-ors"
Today’s blog post author, Rachael, co-host of the YaJagoff Podcast. I am not a frequent traveler, but the few trips this year have proven that the airport is a hub for blog posts. Yep, THE airport, as in any, pick one, THE being the adjective for each and every one in a city near you. So consider this ODE TO THE AIRPORT OF DON’T’s! *Rub your hands together and comment on how badly you wish you had hand sanitizer after a sneezing attack. Oh, and then want to shake a passenger’s hand when departing. How have you been, ya jagoff? *Allow your bratty kid who repeatedly tells you “You are the worst dad I ever had” to pour finger paint on the seats. Clean it up, or how about don’t use finger paints ya jagoff? *Climb over two other seats to get out of your seat….just because. Who do you think you are, ya jagoff? *Aggressively move to the front of the plane to get off when it is clearly not even close to your turn to do so, quit pushing and wait your turn, ya jagoff! This one will make me a better traveler. No matter how much you consider the need to balance looking ok with comfort and flying compliance, leave the loose necklace, over-sized earrings and bedazzled jeans at home. Come on. You know that you have to stand in that box in an awkward stance and the buzzing and lights make everyone aware that you are indeed that person. So, I vow to no longer be the boot or heel-footed, jewelry-accessorizing, bedazzled jean wearing chic you want to throat punch. Oh, and I will also buy stock in sockettes, or peds as to not get airport fungus on my bare feet when it is shoe takeoff time….but that is a whole other blog post, ya jagoff! Previous articleSo the Hotel Wanted to be SEESHY!